The third day of the synod begins as the first two. After Mass, a faldstool is placed before the altar, and the bishop, in cope and precious miter, accompanied by deacon and subdeacon, kneels before the altar, and intones the same antiphon as on the first day: “Exáudi nos, Dómine, quoniam benigna est misericordia tua: secundum multitúdinem miseratiónum tuárum réspice nos, Domine. – Hear us, o Lord, for kindly is Thy mercy; according to the multitude of Thy mercies look upon us, o Lord.” The choir continues the antiphon, followed by the whole of Psalm 68, “Save me o God, for the waters have entered unto my soul”, during which the bishop sits until the psalm is finished and the antiphon repeated. Let us pray. Crying out to Thee, o Lord, with the cry of our heart, we ask as one, that, strengthened by the regard of Thy grace, we may become fearless heralds of the truth, and be able to speak Thy word with all confidence. Through our Lord Jesus Christ etc. Let us pray. Almighty and everlasting God, who in the sacred prophecy of Thy word, did promise that where two or three would gather in Thy name, Thou wouldst be in their midst, in Thy mercy be present in our assembly, and enlighten our hearts, that we may in no way wander from the good of Thy mercy, but rather hold to the righteous path of Thy justice in all matters. Through our Lord Jesus Christ etc. The bishop now sings, “Oremus”, the deacon “Flectamus genua”, and the subdeacon, after a pause, “Levate”, after which the bishop sings this prayer. O God, who take heed to Thy people with forgiveness, and rule over them with love, grant the spirit of wisdom to those to whom Thou hast given to rule over discipline; that the shepherds may take eternal joy from the good progress of holy sheep. Through our Lord Jesus Christ etc. The deacon then sings the following Gospel, Matthew 18, 15-22, with the normal ceremonies of a Pontifical Mass. At that time: Jesus said to His disciples: If thy brother shall offend against thee, go, and rebuke him between thee and him alone. If he shall hear thee, thou shalt gain thy brother. And if he will not hear thee, take with thee one or two more: that in the mouth of two or three witnesses every word may stand. And if he will not hear them: tell the church. And if he will not hear the church, let him be to thee as the heathen and publican. Amen I say to you, whatsoever you shall bind upon earth, shall be bound also in heaven; and whatsoever you shall loose upon earth, shall be loosed also in heaven. Again I say to you, that if two of you shall consent upon earth, concerning anything whatsoever they shall ask, it shall be done to them by My Father who is in heaven. For where there are two or three gathered together in My name, there am I in the midst of them. Then came Peter unto Him and said: Lord, how often shall my brother offend against me, and I forgive him? till seven times? Jesus saith to him: I say not to thee, till seven times; but till seventy times seven times. As on the previous two days, the bishop now kneels to intone the hymn Veni Creator Spiritus, which is continued by the choir, after which he sits at a chair which is set up facing the assembly, and addresses it. A brief model for his address is given, accompanied by a rubric that he himself, or a “learned and suitable man” appointed by him to this task, may address the synod with words more appropriate to the circumstances for which it was called. Venerable and most beloved brethren, it is fitting that all things which have not been done properly, or as fully as they ought, in regard to the duties of ecclesiastics, and the priestly ministries, and canonical sanctions, because of various distractions, or (which we cannot deny) our own and others’ idleness, should be sought out by the unanimous consent and will of us all, and humbly recited before your charity; and thus, whatever is in need of correction may be brought to a better estate by the help of the Lord. And if anyone be displeased by what is said, let him not hesitate to bring the matter before your charity with kindliness and gentility, so that all which is established or renewed by this our assembly, may be kept and held in the harmony of holy peace by all together, without contradiction, to the increase of all our eternal blessedness. There are then read out the constitutions put forth for the approval of the synod (presumably those which were voted upon the previous day), which are confirmed by those assembled. The bishop sits, and commends himself to the prayers of all present; the names of all those who are supposed to be present are read out, and each answers “Adsum – Present.” Notice is taken of those who are not present, so that they may be fined by the bishop. 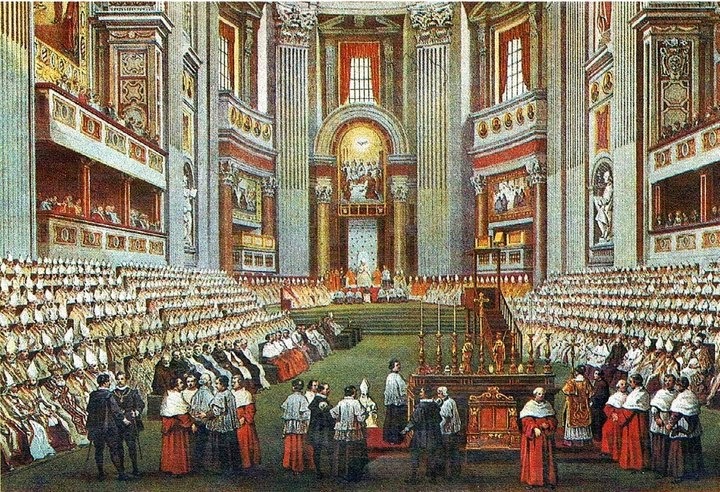 In the Pontifical, there follows an immensely long model sermon, over 1000 words in Latin, in which the bishop reminds the priests of their many duties, both spiritual (“Receive the Body and Blood of our Lord Jesus Christ with all reverence and fear.”) and temporal (“Let your churches be well decorated and clean.”) The bishop then says another prayer. O Lord, the human conscience hath not such strength that it can endure the judgments of Thy will without offense; and therefore, because Thy eyes see our imperfection, deem as perfect that which we desire to conclude, merciful God, with the end of perfect justice. We have asked for Thee to come to us in the beginning, we hope in this end to have Thee forgive what we have judged wrongly; to wit, that Thou spare our ignorance, forgive our error, and grant, though the prayers now completed, perfect efficacy to the work. And since we grow faint from the sting of conscience, lest ignorance draw us into error, or hasty willfulness steer justice wrong, we ask this, we beseech Thee, that if we have brought upon ourselves any offense in the celebration of this synod, that we may know we are forgiven by Thy mercy. And since we are about to dismiss this synod, let us be first released from every bond of our sins, as forgiveness followeth transgressors, and eternal rewards follow those that confess Thee. Through Christ our Lord. R. Amen. The bishop gives the Pontifical blessing and proclaims an indulgence. The archdeacon then sings “Let us depart in peace”, and all answer “In the name of Christ.” All rise and accompany the bishop back to his residence.